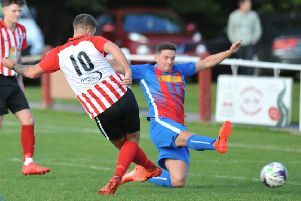 Ryhope CW failed to halt Dunston UTS’ impressive start to the season as the 2012 FA Vase winners put Gary Pearson’s side out of the competition at the second qualifying round stage. Chris Swailes’ side took the lead on 11 minutes when strikers Liam Brooks and Scott Heslop combined for the latter to coolly slide the ball beyond Ryhope keeper Jonathan Ball. Ryhope improved after half-time and James Ellis went close to getting them back level on 51 minutes, but he could only drag a shot wide of the far-post. That miss was punished on the hour-mark as Brooks doubled his side’s lead with a neat finish after he got on the end of a long ball. Nick Kane and Danni Lay both wasted chances to give Gary Pearson’s side a chance of mounting a comeback, but their chances were ended when Ben Riding was dismissed for a second yellow card in the final minute. Seaham Red Star progressed into the first round of the competition for the third time in five years with a win at Daisy Hill. Former Blyth AFC striker Dan Wilson continued his impressive start to life at Red Star after he scored for a third consecutive game to put his side in front on 51 minutes. And Mark Collingwood’s side saw off their North West Counties League opposition thanks to a Vinny Gash goal 16 minutes from time. 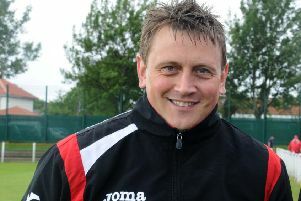 Washington exited the FA Vase at the hands of Division Two rivals Brandon United. Joe Joyce fired Brandon ahead on three minutes, but that goal was cancelled out by Kris Goss’ 12th minute strike. Niall Fingleton put the hosts ahead once again just before half-time, but that lead lasted just two minutes into the second-half thanks to David Smith’s equaliser. Extra-time was needed to separate the two struggling sides it was Brandon Turnbull that was the match-winner as his goal on 98 minutes sent Brandon through. Two extra-time goals from Chris Winn helped Bishop Auckland to a 3-1 win against West Allotment Celtic, while Billingham Town beat Division Two rivals Birtley Town by the same scoreline with Dan Flounders amongst the scorers once again. Jake Day scored the only goal of the game in extra-time as Bridlington Town dumped Consett out of the competition and a Luke Taylor own-goal was the difference in the tie between two former FA Vase winners as Whickham came out on top with a 2-1 home win against Whitley Bay. Goals from Lewis Martin and Callum Oldfield weren’t enough to extend Tow Law Town’s Vase run as Gareth Hill’s hat-trick helped Nelson to a 5-2 win over the Lawyers. Crook Town’s run was also prematurely ended at Ashington, with striker Channon North hitting a treble in a 6-2 win for the Colliers. Nathan O’Neill continued his fine form with three goals in Guisborough Town’s 4-2 home win over Barnoldswick Town. A goal in each half from Dylan Williamson and Stephen Young helped Bedlington Terriers fight their way past Redcar Athletic with a 2-0 win at Doctor Pitt Park.